Pale mauve (H2) flowers, VIII–IX, free-flowering; glaucous green foliage; height 21–25cm; spread 31–45cm. Plants were cultivated under this name by 1846. Named from pallidus = pale. Lavender (H3) flowers, VIII–IX; gold foliage tinted bronze, going darker in winter; compact slender habit; height 21–25cm; spread 31–45cm. Introduced by William R. A. Parsons (Wood Close, Upper Woolhampton, Berkshire, England) before 1977. Named after W. R. A. Parsons, and alluding to the foliage colour. Mauve (H2) flowers, VIII–IX; pale grey foliage; open habit with twisted stems; height 31–45cm; spread 46–60cm. Introduced by William R. A. Parsons (Wood Close, Upper Woolhampton, Berkshire, England) before 1973. Named after W. R. A. Parsons, and alluding to the foliage colour. The first name ends with an s, so it is followed by an apostrophe and an s -- Parsons's. ❁ Pale pink (H8) flowers, IX–XI; grey-green foliage; erect open habit; height 26–30cm; spread 46–60cm. The colour of the flowers is between 'Peter Sparkes' and 'Elsie Purnell'. Sport on 'Peter Sparkes' found by Kurt Kramer (Edewecht-Süddorf, Germany) in 1984, and named in 1986. Pale lavender flowers, VII–IX; bright golden foliage throughout the year; compact, erect; height 31–45cm; spread 31–45cm. Recommended. Seedling; introduced by Heather Acres Inc. (Elma, Washington, USA) in 1993. Named after Pat Cullers, a long-time employee at Heather Acres Inc. (Elma, Washington, USA). White flowers, IX–I; bright green foliage; strong upright but broad habit; height 46–60cm; spread 46–60cm. 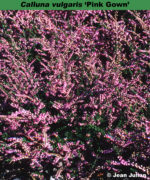 The result of deliberate crossing of 'Battle of Arnhem' and 'Long White' by Kurt Kramer (Edewecht-Süddorf, Germany) who passed the propagation rights to the Dutch Heather Society as a mark of respect to the battle. Pearly white flowers, VIII–IX; mid-green foliage; compact, erect; height 21–25cm; spread 31–45cm. Introduced by Little Park Nursery (Flowton, Suffolk, England) by 1980. Lilac–pink flowers; VII–VIII; foliage deep gold which takes on shades of bronze and red in cold weather; habit low, spreading, compact; height 16–20cm; spread 26–30cm. Resembles 'Arran Gold' but much hardier and more reliable. A seedling raised and selected by Brita Johansson (Vargön, Sweden) and named after the family's fox terrier. Registered 13 January 2000; Brita Johansson, Musselvagen 3, 468 34, Vargon, Sweden. Pink (H8) flowers, VIII–IX; mid-green foliage; vigorous, compact, forms a "bun"; height 10–15cm; spread 31–45cm. Wild-collected; found among stone chippings in a disused quarry near Leedstown, Cornwall, England, by R. A. Ide (Camberley, Surrey) about 1972; introduced by P. G. Zwijnenburg (Boskoop, Netherlands) about 1972. Named after Miss Penny Ide and the shape. Mauve (H2) flowers, IX–X; golden foliage deepening to orange in winter; upright; height 31–45cm; spread 46–60cm. Introduced by Pennyacre Nurseries (Springfield, Fife, Scotland) before 1975. White flowers, VIII–IX; lemon-yellow foliage throughout the year; broad upright habit; height 31–45cm; spread 46–60cm. Found in Fife, Scotland. Beetroot (H9) flowers, IX–XI; dark green foliage; erect; height 31–45cm; spread 46–60cm. An unusual colour. Selected seedling from a deliberate cross between 'Allegro' and 'Battle of Arnhem', raised by Kurt Kramer (Edewecht-Süddorf, Germany). ♤ Bud-bloomer, violet; September-October; foliage dark green; habit broad, open. Wild-collected: found by Kurt Kramer about 1990 near the village of estrup, "in der Nahe von Wildeshausen". Registered on 25 July 2003 by Kurt Kramer. Mauve (H2) flowers, VIII–IX; dark green foliage; very broad habit; height 26–30cm; spread 46–60cm. Introduced by P. G. Zwijnenburg (Boskoop, Netherlands) in 1971. Named after Petra van Dijke, granddaughter of P. G. Zwijnenburg (Boskoop, Netherlands). Mauve (H2) flowers, VIII–IX; downy foliage, silver-grey in summer deepening to the colour of old pewter plate in winter; spreading habit; height 16–20cm; spread 31–45cm. 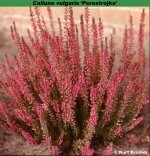 ♤ Pure pink buds, VIII–XII, very abundant; bright green foliage; compact, upright habit; height 26–30cm; spread 31–45cm. A sport from 'Alicia'. Kurt Kramer; Germany - Edewecht. Name alludes to the flower colour and the parent cultivar. Preliminary designation (vorläufige Bezeichnung) was "rosa Alicia". ♤ Bud-flowering; white; IX-XII; foliage green; habit broad, upright; height 50cm; spread 50cm in 4 years. ® C.2007.05 registered 24 November 2007 by J. van Leuven, Geldern, Germany. ♤ Bud-flowering with long flowering spikes, pink; IX-XII; foliage grey-green; habit very robust, upright; height 60cm; spread 50cm in 5 years. ® C.2010:09 registered on 1 December 2010 by Johannes van Leuven, Geldern, Germany. ❁ Shell-pink (H16) flowers, VIII–IX; golden foliage in summer, turning rusty red in winter; erect; height 26–30cm; spread 46–60cm. A sport from 'Golden Dream'; found by G. J. Cookes in 1986 at Little Froome Nurseries (Fenny Drayton, Warwickshire, England); introduced by Little Froome Nurseries in 1990. Heliotrope (H12) flowers, VIII–IX; mid-green foliage; upright; height 46–60cm; spread 61–75cm. Sport on 'White Gown'; found by Herbert Mitchell (Helmsley, Yorkshire, England); introduced by Mitchell by 1976. Occasionally reverts to 'White Gown'. 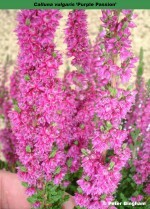 ♤ Bud-flowering; pink; VIII-XII; foliage green; habit broad, upright; height 50cm; spread 50cm in 4 years. Sport on 'Madonna' found by Johannes van Leuven in October 2006 at Geldern. ® C.2007.06 registered 24 November 2007 by J. van Leuven, Geldern, Germany. Lilac flowers, VIII–IX; grey foliage, the young shoots with pink tips which turn silvery pink; height 21–25cm; spread 31–45cm. Found before 1991 and introduced by G. K. Langenberg (Boskoop, Netherlands). Pale lavender (H3) flowers, VIII–IX; young shoots are tipped pink; erect; height 31–45cm; spread 31–45cm. Of American origin. ♤ Red buds, IX–X; dark green foliage; bushy habit; height 31–45cm; spread 46–60cm. ❁ White flowers, VIII–IX; bright green foliage; height 21–25cm; spread 31–45cm. Found at Southport Flower Show, Lancashire, England, by Jack Platt (Ulness Walton, Leyland, Lancashire) in 1974; introduced by Clive Benson (Preston, Lancashire) in 1978. Name alludes to its origins. 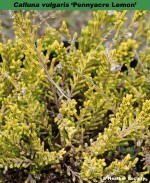 Lavender flowers, VIII–IX; yellow-orange foliage, tinted red and bronze becoming redder in winter; dwarf, spreading; height 16–20cm; spread 31–45cm. Seedling found by R. J. Brien (Pitcairngreen Heather Farm, Perth, Scotland) by 1985, and amed his youngest granddaughter. White flowers, VII–IX; bright green foliage, shoots tipped creamy white in winter and spring; broad spreading habit; height 31–45cm; spread 31–45cm. Of Dutch origin, the name means Pole Star. White flowers, VII–IX; bright green foliage; dwarf, yet very spreading; height 10–15cm; spread 31–45cm. Mauve (H2) flowers, VII–IX, very profuse; dark green foliage; close spreading, yet graceful; height 31–45cm; spread 31–45cm. Seedling; found by David McClintock in his garden at Bracken Hill, Kent, England, about 1976; introduced by Great Comp, Borough Green, Kent, England. It received its name as a result of winning a prize at a Royal Horticultural Society Show on its first showing. ‘Procumbens’ — name for a prostrate plant. Mauve (H2) flowers, VIII–IX; dull green foliage; prostrate, spreading, shoots with downwards curving tips; height 10–15cm; spread 31–45cm. Suitable for hanging-baskets. Found by H. A. Hesse (Weener an den Ems, Germany) by 1935. Named from prostratus = prostrate; flagelliformis = whip-like. Pink (H8) flowers, VIII–IX; gold foliage in summer. turning orange in winter; semi-prostrate; height 10–15cm; spread 31–45cm. Prone to browning. Found by J. W. Sparkes (Beechwood Nursery, Beoley, Redditch, Worcestershire, England): introduced by J. W. Sparkes in 1963. Name alludes to habit and foliage colour. Magenta (H14) flowers, VIII–IX; gold foliage in summer, fading to yellow-green in autumn and winter; narrow, erect habit; height 31–45cm; spread 46–60cm. Sport on 'Firefly'; found at Highland Heathers Nursery (Achahoish, Lochgilphead, Scotland); introduced by Highland Heathers before 1989. Punch was a dog who took a liking for this heather after eating his owner's food! Mauve (H2) flowers, VIII–IX, sparse; dark green foliage; close-growing, dwarf habit; height 10–15cm; spread 16–20cm. Listed by J. Fraser (Leytonstone), in 1866. White flowers, VIII–X, in long spikes; mid-green foliage; height 26–30cm; spread 31–45cm. Makes an attractively shaped plant. Named from pyramidalis = pyramid-shaped. 'This is a later name for 'Alba Pyramidalis' [see D. F. Maxwell, Low road, 1927]. 'Pyramidalis' is being proposed for conservation under the ICNCP (1995, Art. 14). The proposal was accepted in November 2003. 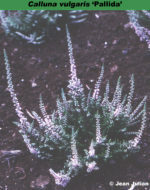 Mauve flowers, VIII–IX, sparse; dark green foliage; dwarf, forming an upright-growing mat; height 10–15cm; spread 31–45cm. Wild-collected in Spain in 1924. Listed by Arnold Arboretum in 1924. Named from pyrenaicus = from the Pyrenees.